This week’s Pick of the Week is our Answering “Wh” Questions cards set! Answering “Wh” Questions contains 23 full-color photographic learning cards that will inspire conversation and speculation in young learners. This week only, take 15% off your online order of the Answering “Wh” Questions cards by applying the promotional code BLOGWHQ6 at checkout! 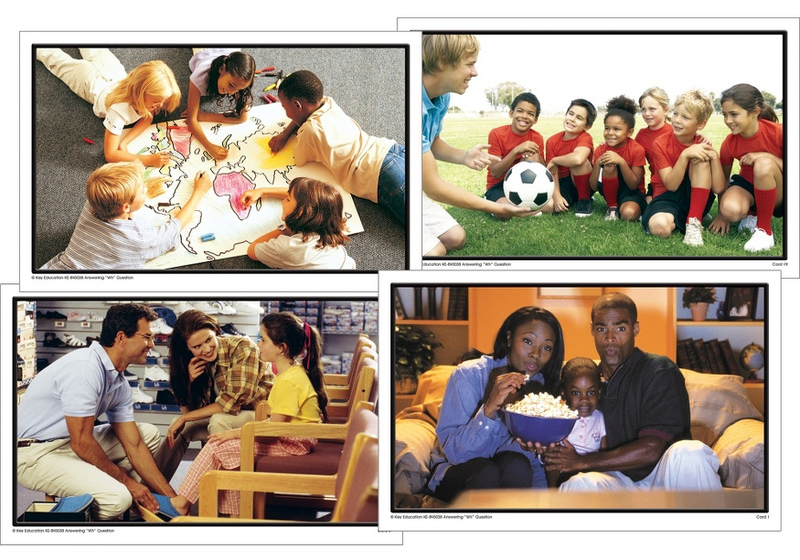 Each photo in this set of cards includes children engaged in various indoor and outdoor activities that encourage language development, emotional awareness, and critical thinking when answering who, what, when, where, why, and how questions. The cards in this set depict children interacting with their peers and with adults in various settings, including the classroom, playground, kitchen, and many more. Answering “Wh” Questions also comes with word lists and a resource guide in English, Spanish, as well as French, to suggest different methods of asking and answering “wh” questions. The Answering “Wh” Questions set is a wonderful way to reinforce basic principles, lessons, and skills. Recommended for pre-K to 2nd grade learners. Remember, this week only, save 15% on your purchase of Answer “Wh” Questions by applying the promo code BLOGWHQ6 at checkout! *This offer is valid until July 29th, 2013 at 11:59 pm EST. Not compatible with any other offer. Be sure there are no spaces in the promo code at check out! Written by: Different Roads to Learning on July 23, 2013.on August 27, 2013. This entry was posted in ABA, autism, autistic spectrum disorder, Behavior, Daily Living Skills, Difflearn Promo Code, Pick of the Week, Products, Sale, Social Skills, Speech & Language by Different Roads to Learning. Bookmark the permalink.